Use this universal, splice-in wiring harness to connect your trailer to your tow vehicle. 4-Pole flat trailer-end connector hardwires to existing trailer wiring. Corrosion-resistant terminals are long-lasting. Lowest Prices for the best wiring from Mighty Cord. Mighty Cord 4-Way Flat Trailer Connector - Trailer End - 4' part number A10-4404VP can be ordered online at etrailer.com or call 800-298-8924 for expert service. 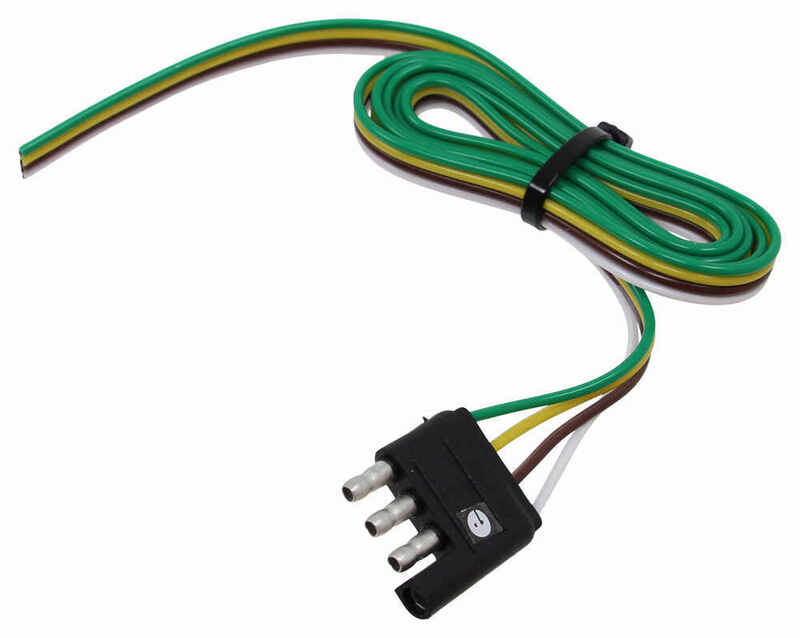 Use this universal, splice-in wiring harness to connect your trailer to your tow vehicle. 4-Pole flat trailer-end connector hardwires to existing trailer wiring. Corrosion-resistant terminals are long-lasting. 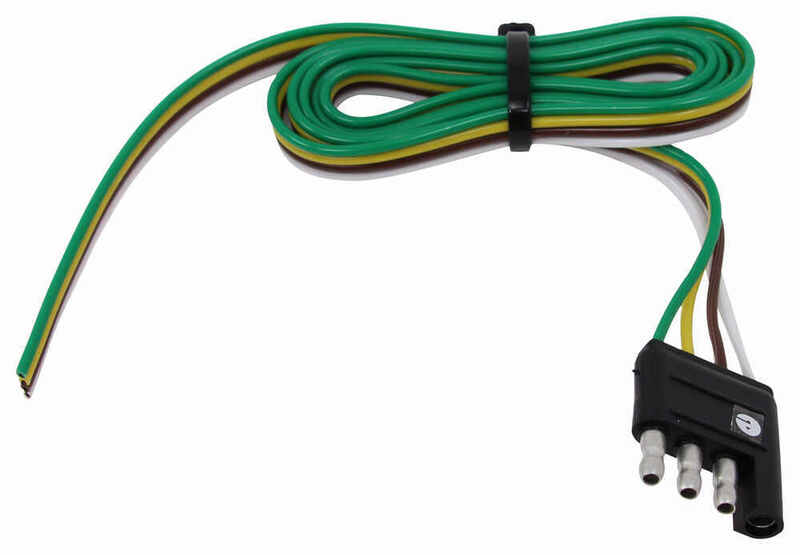 Wire your trailer with this universal, splice-in wiring harness so that you can connect the trailer's wiring to your vehicle's during towing. Corrosion-resistant terminals are long-lasting. Meets SAE standards. Today, we're going to take a look at the Mighty Cord four foot long, four-way flat trailer end connector. This part will wire into your trailer to give you a four-way flat connector that'll plug into your vehicle's four-way flat connector. This is a four-way flat harness, and you can see it has the molded trailer end connector on it. This wire is bonded wire, and again, we mentioned the length of this is four feet. On the very end here, the pigtails, you just split those, and strip them, and hook them into your trailer wiring. The wiring configuration on this is, the green wire would be your right turn and stop light, the yellow would go to your left turn and stop light, your brown would be your taillights, and your white would be your ground. That should do it for the review on the Mighty Cord four foot long, four-way flat trailer end connector. 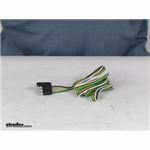 Order: RelevanceNewestRating - High to LowRating - Low to High Use this universal, splice-in wiring harness to connect your trailer to your tow vehicle. 4-Pole flat trailer-end connector hardwires to existing trailer wiring. Corrosion-resistant terminals are long-lasting. 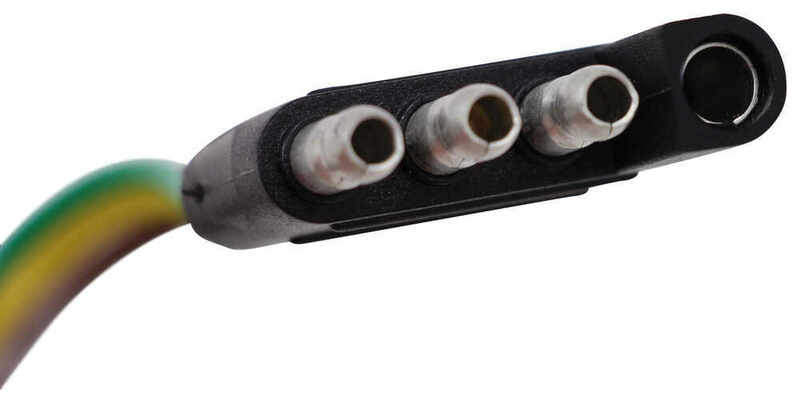 For your trailer with 5-way flat connector to connect to your vehicle 4-way flat, I recommend the Curt Trailer Connector Adapter - 4-Way Flat to 5-Way Flat - Vehicle End # C57187 or the Tow Ready # 20036. The blue wire will connect to your reverse light wire at your tail light utilizing the quick connect supplied with this adapter. A 6-pole flat connector is not a common style of trailer wiring connector so we do not have any adapters to go from a 4-way to a 6-pole flat. Best option would be to install the Hopkins trailer wiring kit part # HM11141824 and then remove the 6 way and install a 4-way in it's place with the part # A10-4404VP. Since the wiring bundle you have is cut off you'll have to splice to whichever style of connector you have. For a trailer side 4-way we have the part # A10-4404VP which you'd have to match color for color to the harness you sent a picture in of. Great service! Ordered on Friday and received on Monday. A tip for anyone looking for the brake controller wiring harness in a 2008 Dodge Ram - it is hidden behing a large white module against the fire wall on the emergency brake side. Remove that module and you will find the harness plug taped behind it.